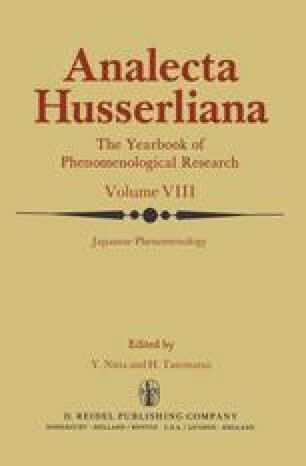 Phenomenology and phenomenological philosophy have been well received in the academic world and by intellectuals, since the introduction of Husserl’s Logische Untersuchungen. Beginning with the Meiji Restoration, Japan quickly absorbed not only science and technology from the West, but also the economic system, the social structure, the legal and political organization, as well as art, literature, and philosophy. And it was thus natural that the introduction of phenomenology and phenomenological philosophy would be similarly appreciated. This introductory essay is a cooperative venture of Yoshihiro Nitta, Hirotaka Tatematsu and Eiichi Shimomissē. Shimomissē is alone responsible for rendering the whole essay into English. Due to the lack of time, it has not been possible for Tatematsu and Nitta to review the final draft. Therefore, if there are any errors Shimomissē will accept the blame for them. The Introduction and Parts I and II were written by Shimomissē. Parts III, IV, and V were written by Tatematsu and Nitta. We are most grateful to Professor Anna-Terresa Tymieniecka, Editor of Analecta Husserliana, for her incessant encouragement, invaluable assistance, and compassionate understanding and patience to bring about this volume.